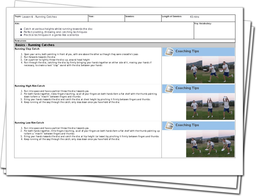 This session is specifically designed to implement drills that represent game play. Players work on developing their basic catching skills and adapting them to movement of play drills. The session provides break-down videos of running clap, high and low rim catches. This is a very dynamic session and the drills used are very game realistic. By the end of training players should have improved their catching skills on the move. The players will have a better understanding of movements of play to significantly improve the flow of the game, whilst continually improving their catching skills. The focus is directed to the objectives of the game rather than the specific mechanics behind the techniques.